Spending a weekend and vacation on leave is indeed very romantic if filled with beautiful moments with your partner. For those of you who want to plan a long vacation with your partner, there are lots of fun, beautiful and fun places. You and your partner will be made memorable and don’t feel like going home. Hence the descriptions of dating norms In Indonesia you must know. 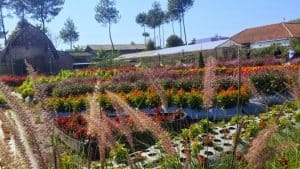 Lembang Begonia Garden, the advantage of this park is Balinea flowers. There are a lot of unique photo spots, such as Keong rakdasa, miniature delman, love flowers, and many other facilities. Those of you who like park tours and natural scenery are perfect for spending time together walking around this park. 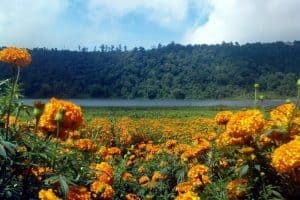 You can also book hotels around the park which are provided a lot, the more complete your holiday will be by enjoying the Bandung-style food. This place offers an outdoor concept with transparent tents lined up on the hillside. Consisting of these fun and interesting eating places presents Bandung view from the top, you can also try interesting rides that have been provided such as mini golf courses, tents, and various other facilities that are indeed interesting to try. For your references finding the best hotels in Yogyakarta Indonesia you can try it. 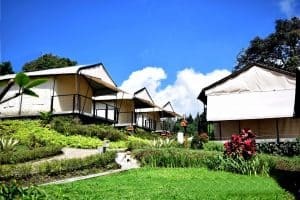 The place to visit in Indonesia for the next couple is Trizara Resort, a romantic tourist spot in Bandung, providing complete facilities in every tent like in a hotel. A very charming place and indeed very suitable for couples who want to spend time together in nature with a cool atmosphere, comfortable and fun. 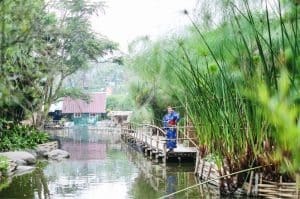 Kyotoku at Floating Market Lembang is a place for couples who can taste the atmosphere of Japan without needing to take a plane to the land of Sakura. You can rent traditional Japanese and Korean clothes and take pictures in a variety of settings, such as cherry blossom gardens. Then, the lake is complete with a boat, until Japanese traditional houses are very fun to be made into holiday memories. There are the lovable facts about Indonesia Weddings you must know. The places to visit in Indonesia for couples continue to the park. There are very neat gardens, water pools, and Balinese carvings. Pool water at the Tirta Gangga tourist spot is very clear and cool. The reason is that the pool water is the source of natural springs rather than processed water. You can soak and bathe in the water provided in this place, you can also enjoy the beauty of the garden and the location is so clean and cool. Jimbaran Beach, Bali is a beautiful and pleasant beach to spend time together with a partner. 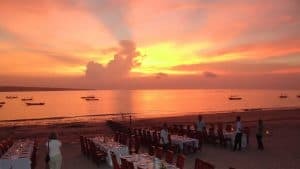 White sandy beaches with beautiful natural scenery, you can enjoy the sunset and enjoy dinner in a charming beach atmosphere. You can book a hotel with an offer of luxury prices and facilities around the beach. What will definitely make your holiday and your partner become more memorable and unforgettable?. The following about the nice and best food restaurant in Bali Legian you must try!. Temukus Village is a quiet village in East Bali, adjacent to the most sacred temple. Many villagers plant flowers, so you will easily find a flower garden there. But don’t forget to ask permission from local residents before entering their garden, it’s good if you will visit this place before the harvest season, so you can see a garden full of beautiful blooms and very charming flowers. You and your partner can take pictures or relax while enjoying the facilities available. 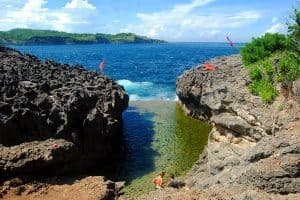 One of the places to visit in Indonesia for couples is Angel’s Billabong, is a very beautiful and pleasant beach. The interesting thing is that crystal-clear water emits a greenish tinge like a beautiful emerald. You can step on it without worrying about slipping because it is not slippery and very comfortable and you can relax enjoying the beautiful scenery and playing water with your partner. Here are a few the best sunrise in Lombok you can see. One location with a prominent romantic spot, Love Pier, Le Bridge can be a place to spend the night after spending an afternoon strolling and enjoying the fresh sea breeze in Jakarta. A sparkling evening or evening atmosphere at Le Bridge’s luxurious restaurant. While accompanied by candlelight and the surrounding pier light can make a couple or pre-wedding, a suitable location to spend with your partner to be more intimate and full of love. Dunia Fantasi has become an enduring recreation option for visitors to the capital. The biggest amusement park in Indonesia and a romantic location scattered in a large playground area can be when playing together in Turangga’s play comedy game or swinging behind a glittering night sky in the Ferris wheel. You and your partner can enjoy a variety of rides or just walk around looking for the right game to enjoy together. 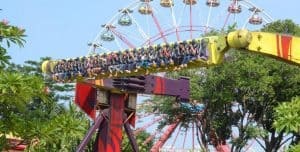 Feel the excitement and excitement of your day only on DuFan and the cool and comfortable air. Here are some the interesting facts of Jakarta Old Town. Taman Suropati is a beautiful city park and fun, you can roll out mats and lay together on a stretch of grass accompanied by snacks and drinks or walk along the path between the shady trees while holding hands that are very romantic. You can also capture the moments together by taking photos and enjoying shows that are often held on weekend days. Thousand Island is located in the Thousand Islands cluster north of the capital. Examples of one island such as the Macan island are the perfect holiday getaway from the crowds of Jakarta. The Thousand Islands as the parent of a variety of exotic islands of marine tourism always open up opportunities for great natural exploration. Being on an exotic island that is quiet with private accommodation for both, roofed with blue sky and surrounded by clear sea, as if the world really belonged to both. You can book lodging on the Macan island which has an exotic and attractive building form to spend only with your partner. 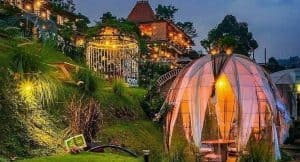 The intereserting thing and unique wedding Venues in Jakarta. Old Town, a colonial building of Dutch heritage would certainly make the event of a trip with a partner become more romantic. Not only admire the beauty of the old building, but you and your partner can also ride or take pictures with the background of the old city. You can also enjoy the food menu in various restaurants provided around the old city while enjoying a relaxing atmosphere in the afternoon and evening. Ancol, beach tourism is one of the attractions that can awaken a romantic aura. Jakarta also has many romantic beaches, one of which is Ancol. Tourist attractions that have a complete entertainment package, and rides for games and cool and beautiful natural scenery. During the day you can play in the Fantasy World game. 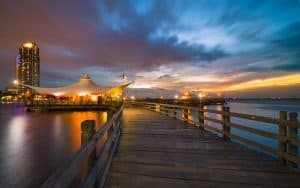 And in the evening you can take a leisurely stroll around Ancol Beach to enjoy a very romantic evening atmosphere. Here are many things and the interesting facts of Jakarta City, Indonesia. 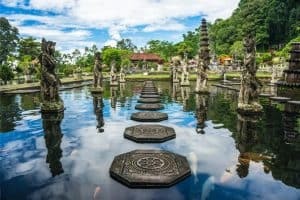 Hopefully, some places and examples of places to visit in Indonesia for couples are the choice of you and your partner to vacation and relax spending time together.